Teak Shutters, Motorized Plantation Shutters, Rolling Hurricane Shutters, Solar Powered Shutter Wall, Sliding Louvered Doors, Hurricane screen, Retractable Awning and Screen Teak Shutters, Motorized plantation shutters, hurricane shutters, motorized shutter wall, hurricane screen, rolling shutters, rolling door, colonial shutter, retractable shades, wood shutter and more. Rolling Hurricane shutter Wind protection up to 220mph, 125PSF Miami-Dade County, Florida Approval . Sun powered motorized shutters. Let us show you the benefits of the most technically advanced plantation shutters, hurricane shutters, rolling shutters and rolling door in the industry. We are not just a manufacturer. We're a full service company. We design, measure, manufacture, install, and provide after-sales warranty. Serving Florida. We ship world wide. Our newest roll-up hurricane shutter withstands incredible 83.2 PSF (over 180mph) at 232” width with out any storm bar & any support. That is the strongest roll-up shutter in the industry. When the shutter width get smaller than 232" strength of the shutter goes up! Rolling shutters ready for shipment in 2 to 3 weeks, installation 4 to 8 weeks! Our hurricane shutters made from double sided extruded aluminum louver and Unique High Impact Polymer . Best hurricane protection. Insulation. Light control. Security. The resale value of your home may increase because plantation shutters are so desirable. Faux plantation shutters. Sliding shutters partial slide open. Sliding shutters slide open. 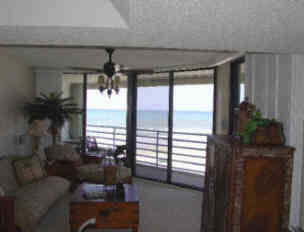 Shutters On The Beach condo. 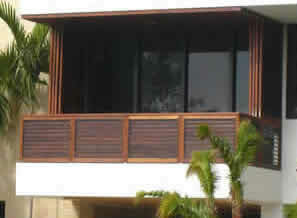 Teak shutters with built in screen. Window Shutters can be fancy or neutral depending on the impression your trying to make. You can Bring a room to life with colorful shutters to give a vibrant touch to a dull room. 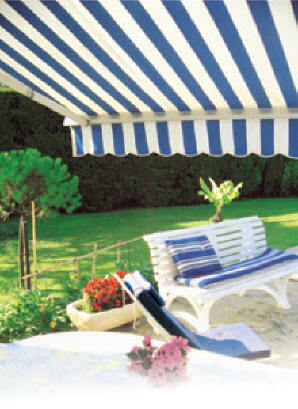 Awning will lower your energy bills and it will improve appearance. In order to enjoy your conservatory to the full, it is important to give careful consideration to your solar protection equipment. Several points are worth spending some time on to get them just right. At midday, at the height of summer, the temperature in a conservatory can reach more than 95° F. If the conservatory is made of glass or cellular material, it will suffer from the “greenhouse effect”. How can you control the greenhouse effect? If this effect is noticeable in winter, it presents significant drawbacks in spring and summer, as soon as the nice weather comes. In order to maintain the interior of a conservatory at a pleasant temperature, you need to be able to modify the penetration of the sun’s rays according to climatic conditions. For this reason, making good use of the sun’s energy by a conservatory is largely dependent on the effectiveness of the roofing and windows. Sunlight generates heat in a room, especially in south and west-facing rooms. Awnings, by shading the exterior windows and doors, cut the light before it enters the room, which can reduce interior heat by 77% (the American Society of Heating and Air Conditioning Engineers or ASHRAE). Reducing the heat in a room with retractable awnings can reduce air conditioning use – and energy bills – by almost 25%. Awning and solar screens provides the solution. The one shutter in the industry that is truly ULTRA CLEAR! We have an interior mechanism that provides a "One Touch" adjustment feature that allows you to open and close your shutter by simply touching one louver. We have completely eliminated the tilt bar altogether! Choose to have one section or four. The possibilities are endless! Combine our Ultra Clear with our reinforced louver for a truly unobstructed view! By shutters manufacturer. We custom make hurricane panel to fit any shape opening. Hurricane panel comes as painted, un painted and clear .Hurricane panel can be easily installed before hurricane and restore after hurricane. Each section comes approximately 13"wide ,height will be 5" to 10" taller than opening. WHEN ONLY THE BEST WILL DUE....FLSHUTTERS.com IS THE ONLY COMPANY FOR YOU! We design, measure, manufacture, install, and provide after-sales warranty for interior and exterior shutters . For your house. For your business. Most durable, most practical hurricane, tropical storm protection. Provides complete protection against hurricanes, tropical storms, heat, cold, sun, noise and theft !Can be custom colored. Rolling shutters can be built up to 18' wide. Bahamas Shutters. 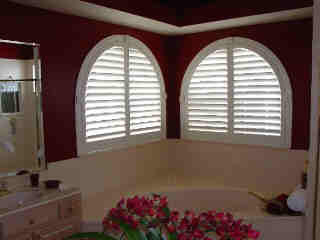 Our Bahamas shutters are fully functional and attractive. Adding architectural elements to your home. Made from extruded aluminum, not only can the shutter panels tilt open and closed - the louvers also tilt open and closed. You will have a full view when open and light control when they are closed. 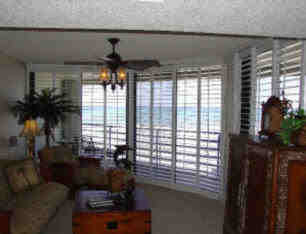 Bahamas Shutters also provide protection from hurricanes, tropical storms and theft. Colonial Shutters. Our Colonial Shutters are made from extruded aluminum and fully functional. It will not only dress up your windows from the outside when they are opened to the side. During a storm, you can close and lock for the Colonial Shutters for hurricane protection. Unfortunately there is a size limitation. Large size windows may not be covered by Colonial Shutters. Hurricane shutters, storm shutters by shutters manufacturer. Copyright © FlShutters.com All Rights Reserved. Introducing the most versatile shutter ever! SHUTTER WALL It is a window, it is a door, it is a screen, and it is shutter. All in one product. Elegant design, decorate and protects same time. Motorized or manual control, Fixed or Sliding or Bi-fold. Vertical, horizontal, skylight or angle installation. 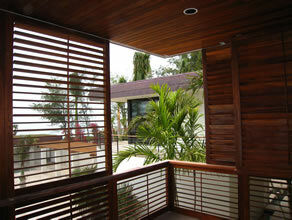 Great products for tropical shutter screen combination. Great for every where else as a shutter glass combination. Shutter-wall powered by sun, louvers movements control by sun powered motor. During the day solar power charges the batteries. Shutter can be operated day or night time. Shutters deliver the "goods." GREAT looks, GREAT light control, GREAT insulation and GREAT life expectancy. Marine grade wood shutter made from TEAK .Teak shutter is best choice of wood for out door and marine application .Teak shutter is very stable against weather. 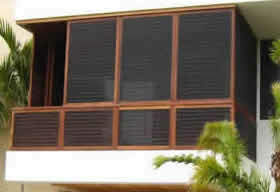 Teak shutter can be built as a shutter door, sliding shutter door, bi fold shutter door. We also make cypress shutter for exterior application. Shutters have been used as an adjustable window covering for centuries. The look is clean and the design is functional. Opened louvers allow high light penetration. Adjusting the louvers varies the light penetration down to full closure. Shutters provide a finished look . Shutters can be used indoors as well as outdoors. Plantation shutters can be installed on a lanai or used around a pool for privacy. Reinforced louver will allow you to go up to a thirty-eight inch panel. We also offer Ultra Clear shutters. Ultra Clear plantation shutters have eliminated the tilt bar altogether. Ultra Clear plantation shutters have an invisible internal mechanism that allows you to adjust all of your louvers by simply touching one. Ultra Clear shutters can be divided into as many different sections as you would like. Perhaps just two sections to allow the bottom to be closed for privacy and the top left open for light, perhaps more. Really, the possibilities are endless. Shutter manufacturer. Now we manufacture hurricane shutters, storm shutters. . We use best components available to manufacture hurricane shutters, storm shutters by shutters manufacturer. 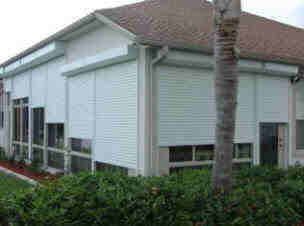 Hurricane shutters,rolling doors, roller shutters, Bahama shutters, hurricane panel, storm panel. When the windows are opened, the view will not be obstructed . When closed, it will bring you safety, comfort and economization on energy to your home and business. 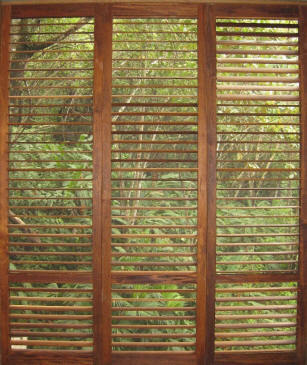 These shutters do more than provide protection against hurricanes, tropical storms and the element. They truly are beautiful! The most important value of our HURRICANE SHUTTERS, STORM SHUTTERS, BAHAMAS SHUTTERS and COLONIAL SHUTTERS are their extreme durability. 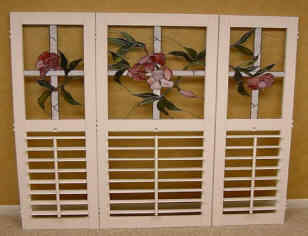 Did you know that we can custom make shutters for almost any shape window? Arches, circular windows and triangles are no problem! Our sliding shutters can be made any shape and any size! Motorized vertical sliding shutters for exterior & interior application up to 24' wide single shutter ,no vertical guide required. We have taken SHUTTERS to an entirely different level! State of the art ! Shutter designed for those who do not wish to have their view obstructed! One touch controls! Adjust shutter by simply touching one louver! BE PREPARED TO BE IMPRESSED!! One company does it all...Design, Measure, Manufacture &Install!!! Shutters are an investment in your home. As with any investment, be sure and and do the research. Fl Shutters have been unsurpassed in quality ! Providing you, the consumer, with superior products that can stand the test of time. Fl Shutters use on grade A, furniture quality Bass and Poplar wood in our exclusive wood line. CHECK OUT OUR EXCLUSIVE FAUX FINISHES for a truly one of a kind look! Ten times more heat can pass through a glass window than through an uninsulated brick veneer wall of the same area. Shutters will help control heat transfer within your home and save you money and energy through the more efficient use of heating and cooling systems. Maybe you love stained glass. We can insert stained glass into your shutter. Providing a beautiful display of art in your home. Shutters truly are the one piece that can turn you house into a home. Shutters will be there as long as your home is there. Shutters can transform themselves from very traditional to very contemporary. Plantation shutters will be the one thing in your home that can change with the times. SHUTTERS ARE SIMPLY TIMELESS! By shutters manufacturer. Now you can add protection, privacy and insulation to your home at the touch of a button. Motorized rolling shutters and rolling doors provide an instant "safety shield" to the exterior windows and doors of your home when you desire and conveniently roll up and out of sight at the simple push of a button. Motorized rolling shutter and rolling doors are a highly functional product, protecting your home or office against burglary, vandalism and storms, as well as providing added insulation to your windows and doors -- plus instant privacy when you want it. Rolling shutters and rolling doors provide a two-way thermal barrier for your windows and doors to shield out the heat and cold. They reduce heat gain and air conditioning costs in the summer and keep out the cold to reduce heating costs in the winter. You can save even more, because motorized rolling shutters help protect your carpet and furniture from sun fading -- indoors or out, on a balcony or lanai. So you can decorate as you desire and everything will remain bright and beautiful year after year. A unique feature of rolling shutters is the vented position. While in this position, your rolling shutters provide built-in ventilation; you can control sunlight and air circulation throughout your house while maintaining total privacy. You can see out, but no one else can see in. Handsome designs complement your exterior decor without hiding your windows. Motors tubular motors.